The Conservative Party has launched an adapted version of its 1979 'Labour's Not Working' campaign, made famous by the Saatchi brothers. The campaign entitled, 'Labour Isn't Learning' has been created by M&C Saatchi and launches to coincide with the Labour Party's annual conference taking place this week in Manchester. Posters will be displayed on a van touring Manchester to greet conference attendees as they arrive in the city. It is the first of a series of ads attacking Labour, which are expected over the conference period. The ad refers to a study by the Institute for Fiscal Studies, which estimates Labour would borrow £200bn more than the Conservatives. The Saatchi brothers were behind the famous Conservative "Labour's not working" poster for Margaret Thatcher's 1979 campaign, when they were still at Saatchi & Saatchi. It was Lord Saatchi, who has long championed the Conservative Party, who devised the "Labour isn't working" ad that is widely credited as being a major factor in the success of Margaret Thatcher's 1979 election campaign. Following the campaign, Lord Saatchi became co-chairman of the party. Grant Shapps, the Tory party chairman, said: "Labour isn't learning. They still think we can borrow our way out of the debt crisis. Their plans would mean borrowing over £200bn more. They would shackle every person in this country with £3,200 more debt – over and above the debt they already ran up when they were in government. 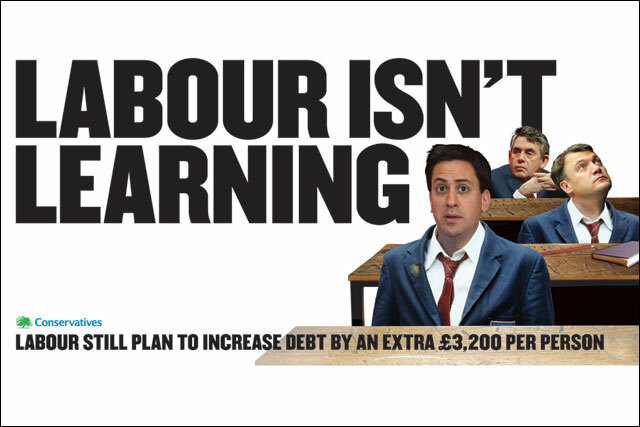 More spending, more borrowing, more debt – Labour isn't learning."